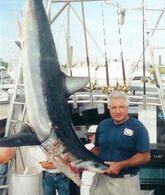 deep sea fishing in Cape Cod and book your next trip with us today! Make reservations now for a deep sea charter in 2019. It's going to be an adventurous and a wicked thrilling year for Fishing in Cape Cod! 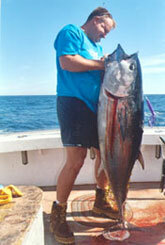 We are now taking reservations for all types of our deep sea fishing charters. If you love Cape Cod, deep sea fishing, and have a variety of favorites to chase after, you’re in luck. 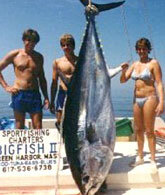 Big Fish Charters produce exciting adventures no matter which type of fish you desire! With over 40 years experience, we specialize in cod, tuna, striped bass, and shark, and offer many other charters including pollack, haddock, halibut, wolffish, monkfish, and bluefish. Whether you are traveling to the area for business or pleasure, take some time and reserve a spot on one of our Cape Cod Fishing Charters. Enjoy a taste of the Cape aboard a thrilling Big Fish Charter today! We operate from Marshfield, Massachusetts, close to Boston and Plymouth. 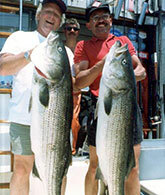 We can take up to six people per boat on our quality Cape Cod Fishing Trips. We have trips to the Stellwagen Bank, Cape Cod Bay and other offshore waters within New England. We are a full-time, 7 day-a-week, professional deep sea fishing charter business totally equipped to meet the demands from novice to experts. Unlike part-time charter boats, we must consistently produce fish for you, since this is our only business and we depend on your repeat business to make our living. In over 40 years on Stellwagen Bank we have consistently been a "high-liner" in top catches, have taken several I.G.F.A. 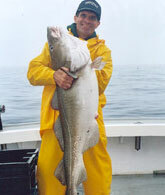 and World Records and have won every major tournament in our area for Cod species as well as Giant Tuna and Striped Bass. Our customers have won the Governor's Cup for cod, halibut, and Giant Pollack in the Massachusetts Saltwater Contest many times over the years. Come and be a part of all the excitement! Planning a special party? Consider booking one of our Cape Cod Fishing Charters for your next Anniversary, Bachelor Party or Birthday! 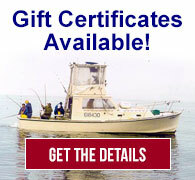 Our Charters are the perfect gift for Father's Day!